"I've only been to Tuscany once, but I do remember a grilled steak coming off a charcoal fire, which was then sliced and splashed with olive oil, lemon, and rosemary. 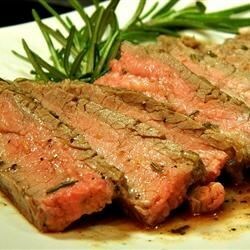 While I'm sure my version is far from traditional, it's really tasty and the very user-friendly flank steak is the perfect cut." Combine 1/2 cup chopped fresh rosemary, garlic, 1/3 cup olive oil, 1/4 cup lemon juice, black pepper, 1/2 teaspoon red pepper flakes, and 1/2 teaspoon salt in a blender or food processor. Blend until smooth and set marinade aside. Pierce the steak with a fork 20 to 30 times. Place in a shallow baking dish. Pour marinade over steak and flip to coat both sides. Cover and refrigerate for 4 to 8 hours. Combine 1/3 cup olive oil, 3 tablespoons lemon juice, lemon zest, 1 teaspoon minced rosemary, 1/8 teaspoon red pepper flakes, and a pinch of salt in a jar. Cover and shake the dressing to combine. Shake again before using. Remove steak from marinade; scrape off any chunks of marinade. Discard used marinade. Season steak with salt and black pepper. Place steak on the preheated grill and cook until browned on the outside and red on the inside, about 6 to 8 minutes per side. Place 2 tablespoons of the olive oil-lemon juice dressing in a small bowl. Use rosemary sprig to baste the steak while it cooks. An instant-read thermometer inserted into the center of a steak should read 125 degrees F (52 degrees C) for rare. Remove steak to a platter and allow to rest about 6 minutes before slicing. Cut in half lengthwise, then into 1/4-inch-thick slices at an angle against the grain. Drizzle with additional dressing. Delicious. It didn't need any adjustments for us. I really liked the flavor of the marinade, but they were just to subtle to stand out on beef. We're thinking it will be to die for on chicken! I use this marinade for just about every type of meat, any steak, lamb and pork. Absolutely delicious and easy!